Rex Regis — L.E. Modesitt Jr. The saga of the Imager Quaeryt, Commander in the forces of Lord Bhayar, reaches a new climax as the great struggle to unify the continent of Lydar enters its final phase in L.E. 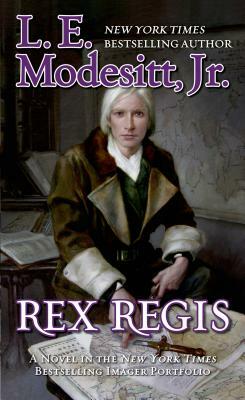 Modesitt's Rex Regis, Book 8 in The Imager Portfolio. Only the land of Khel remains uncommitted to Bhayar's rule. Their decision could mean a lasting peace, or more conflict across an already war-ravaged realm. While the conqueror of Bovaria awaits emissaries to arrive with news of Khel's decision, other weighty matters occupy Bhayar, his sister Velora, and her husband Quaeryt -- not the least of which is the fulfillment of Quaeryt's dream to create the world's first Imager academy, where the magical abilities of these powerful casters may be honed, managed, and put to the service of the common good. But before that dream may be realized, or Khel's fateful choice made known, the spectre of high treason threatens to unravel all that Quaeryt has achieved, catapulting him toward a fateful confrontation with Bhayar's most powerful military leaders.